Connect with quality buyers and gain new accounts. Have more time in your studio with our online marketplace. Grow your wholesale business today! Let IndieMe setup your store for you! Available for all artists*. *Upon jury approval, email service@indieme.com with your Linesheet and a link to your Dropbox folder. We'll take it from there! Limited to 100 items only. Receive orders on our secure Marketplace and manage all the details of those orders. Link to your personal website, line sheets, pdf's, videos and so much more. Promote your show participation and share your story. Customize your page with banners, logo and studio images. * For all plans, $20 application fee, upon jury approval you will receive a free featured ad (value $22.50). All applicants must be juried into the IndieMe Marketplace with 12 products. 1-year commitment for all listings, plans renew automatically after first year unless requested to terminate membership. Request must be submitted via email within 30 days to service@indieme.com. We have everything you need to grow your business. Over 100 features for Buyers and Artists! We have multiple advertising opportunities for you. 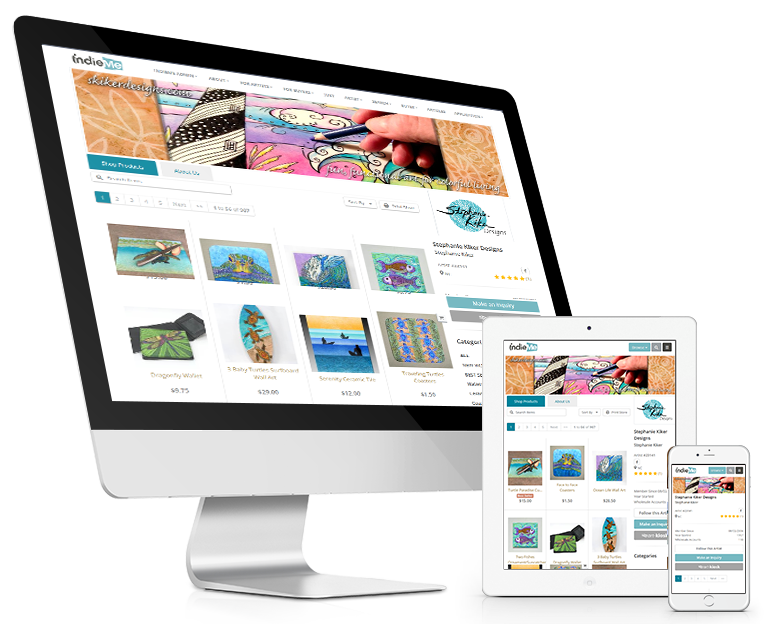 Our printed catalogs enable retailers to quickly find artists online at IndieMe™. All of our print opportunities help retailers plan for in-person artist visits at NY Now™ and other major wholesale shows. Incentive pricing for first-time ads, multiple ads and renewal ads maximizing your results and offering substantial savings. Our Buyer's Guide features full color ads, offers multiple ad sizes and produces great results. Direct mailed to over 20,000 qualified buyers. Advertise in our specialty catalogs and focus on your niche products. Emailed to entire member database and in our publication archive. We did the work for you and negotiated the best ad rates possible in major trade publications. Full color ads at a fraction of the normal cost. Have questions? Want to gather more information? Contact us today and a member of our knowledgeable sales staff will provide you with a demo of our website and provide you with all the information you need. Email us at service@IndieMe.com or call 888-427-2381. Great! Review our artist requirements and select the showcase that best suits your medium. Contact us at any time for additional information. Email us at service@IndieMe.com or call 888-427-2381.